So now that school is officially over (I turned in my last final yesterday! ), I hope to finally stop neglecting the other parts of my life. One of those areas is definitely fitness. 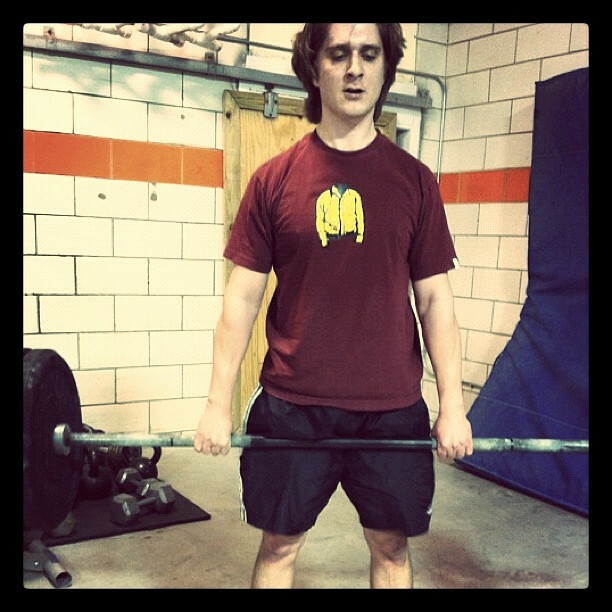 We started Crossfit in September, and although we’ve been going religiously, we haven’t really talked about it. Part of that was purely the lack of time, the other part was that we wanted to feel invested and committed (read: informed) before diving in and having anything to say. We really kind of stumbled into Crossfit and Paleo. What started as a trial visit to a friend’s gym and a one month goal to clean-up our diet has led to a complete lifestyle change we’re now four months into. It’s one of the best decisions we’ve made in a long time. I think what we love most so far is that while the workouts are tough, we spend little time actually thinking about them while they’re not going on. Yes, despite all appearances, we’re truly lazy at heart. Unlike a normal gym where you are on your own to make sure you get a thorough workout (with the exception of classes), we show up every day to a planned and scalable workout that allows us to work out together, but still feel like we’re individually challenging ourselves. We not only workout together, we work out with a whole group of people. 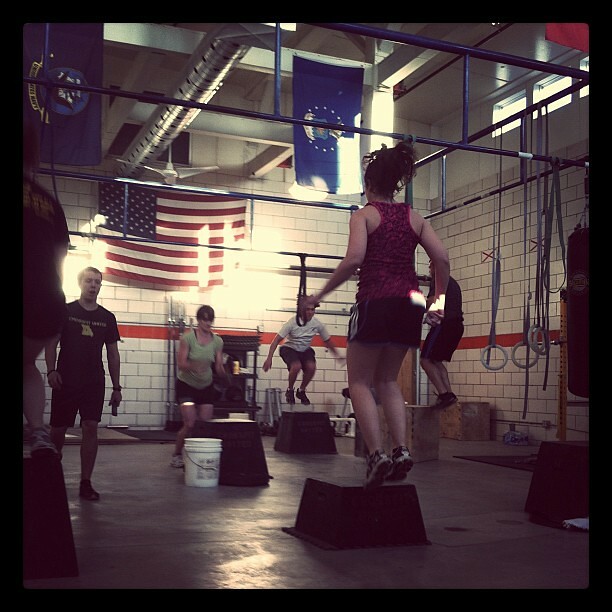 A Crossfit gym (or “box” as they are sometimes called) is a community. We barely knew a soul at our old gym, and day-to-day, we could go a whole workout without saying a word to anyone. At Crossfit, we are constantly interacting and invested in each other’s struggles and successes. Hopefully this doesn’t sound too lame, but I haven’t made new friends like these in years. Some people have likened it to a cult. I think that stems from how people perceive the enthusiasm. We’ve lived in our house seven months and have only met one of our neighbors. We’ve been in Crossfit for four months and I can tell you at least 10 things I’ve learned from and about everyone in the gym. In a society where neighbors are now strangers, it’s hard not to be excited about finding that kind of community again. The enthusiasm also comes largely from the workouts. You’re giving something your all, you’re seeing the results, and you can’t help but get excited, and it carries over to your entire life. You’re excited about where your life is going, and you want everyone to benefit from your gain. It’s the closest we’ve ever come to any sort of religion, which I’m sure doesn’t help its cult status, haha! The reason why Crossfit instantly appealed to me was because of the intensity and difficulty level of the Workout of the Days (WODs). I was looking for something that would push me far beyond my capabilities, and Crossfit on the onset certainly met that mark. Even 4 months in I cannot do the “prescribed” weight or quantity of most WODs and I see that as a good good thing because it leaves me lots of room for growth. While for some this may seem daunting, it was exactly what I was looking for. Another reason is that I wanted something that did not consist of hours of aerobic exercise like running, jogging, or any other gym “machine”. I simply do not have time for it, and it is BORING (to me). Furthermore, even after I had done hours of aerobic exercise, I would then still have to make days and time for my strength training. 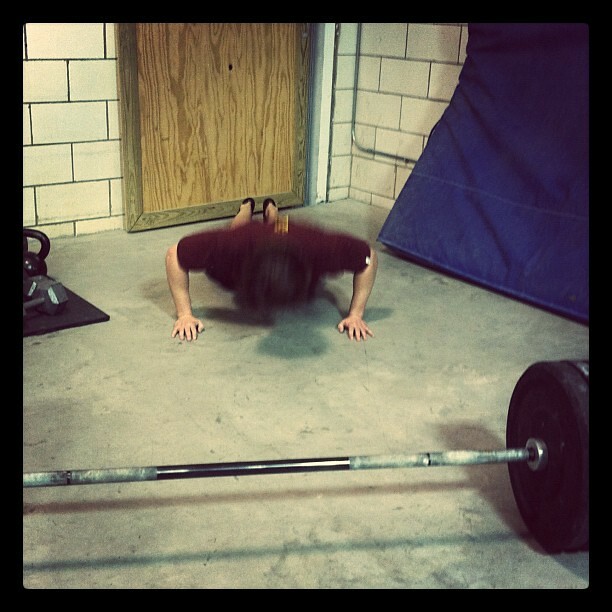 Crossfit works on anaerobic strength training and calisthenics. The best part is that you get increased fat loss along with increased strength, tone, and you’re building usable muscle groups. I would rather be burning fat because I have a myriad of strong/usable muscle groups than because I spend 10 hours a week on a treadmill. 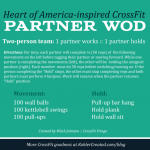 As Jes mentioned, I love the teamwork and commoradary aspect of Crossfit. Being a long time soccer player, a team setting is what I am used to and its what keeps me motivated. I thrive knowing that every day I go to Crossfit with my “team mates” and we will be encouraging each other, and suffering together. 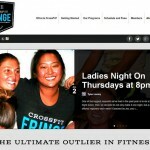 Did you know that our Crossfit group does evening socials/eats? Pretty cool. (Jes) Spousal enthusiasm and reinforcement is worth its weight in gold! Obviously, we could go on all day, but that’s kind of the last four months in a nutshell. Like I said, now that we’re invested, we feel okay talking about it and actually showing you more of it. So let’s start with last night’s WOD. As you can see, I’m doing modifications from the prescribed exercises. 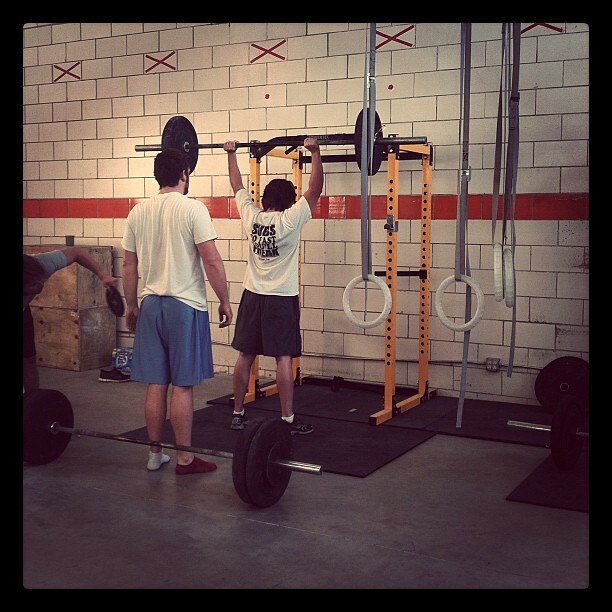 Because Crossfit is scalable, it works well for all fitness levels. As I had literally no fitness or exercise background going in, I’m moving slowly up the scale to avoid injury and master form to accommodate increasing weight, reps and movement over time. How did it go? It was a really challenging WOD. I’m just starting deadlifts and squats with the bar, so my legs feel pretty brutalized. Neil is getting really good with prescribed max pull-ups and has not used the band in a month or so. Dinner afterward was a huge sesame-ginger stir fry. Have you ever stumbled into something that completely changed your life? Note: Sorry for the Instagrams, our camera (as well as ourselves) have been pre-occupied with paid photography work. I also don’t want to drag the camera to Crossfit, so those will all be Instagrams and cell pics for the time being. I promise to stick to the less distracting filters! Thanks Chrissy! I think we all have the desire to belong to something. For some it’s church, for others its Roller Derby, for us, this feels like it. It’s hard to make connections these days, but when you do, it feels great! Good Job on the dedication guys! I’m really lacking it right now with running, I don’t have anyone to run with so I totally understand the idea of having friends to work out with makes it much easier. Keep the motivation! I also appreciate the disclaimer for the Instagrams, personally it drives me nuts to see them, I’m not big on the idea of faux-old photos. I was hoping it wasn’t just me sub-consciously protesting against the hot new online thing. (Which I tend to do and be good at). Yeah, I haven’t burned out entirely on running, but because of my schedule, I end up running solo, and it feels hard to really motivate myself to push harder or get out there in the morning, especially on weekends. The good news is that Crossfit has actually improved my stamina, so when I do run, I am enjoying it a lot more, and I feel stronger. I hope to run some races in the coming year. As for Instagram, it’s not my favorite medium, but my “stock” cell pics don’t have a lot of contrast, and it makes some details harder to discern. I have Photoshop for iPhone, but it’s time consuming to manually adjust photos, so I use the one filter on Instagram that does what I want, which is to pop the contrast and make the picture a square. Instagram also connects with my Flickr account faster than the Flickr app (irony), so uploading pictures is fast. Sounds great guys, enjoyed the photos! What are some sample numbers from the 5x max pullup (and modified pullup) sets that you guys are doing? I cannot speak for Jessica but my max strict (non kipping) pull up is around 20, for a 5x max I am somewhere around 70-75 pull ups. Thanks for the info Neil. Nice work ! Since I’m still on modified box jumps (and often forget to count), I would guess that I’m somewhere around 25, with a 5x max around 50. 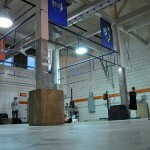 Again, all modified box-jump hanging pull-ups. Thanks Jess, nice work on your part too! Thanks for this summary on Crossfit. It probably wouldn’t be quite the right fit for me (I avoid a lot of impact exercises because of knee problems), but I love getting the “inside” look at it! I like showing that it’s not all “competition” crossfit, that it can be a tool to fuel other things, and frankly, just staying healthy on a “newbie” level. Some friends around town are doing Cross-Fit and I never knew exactly what they were doing. Great post! And it looks like an awesome workout. 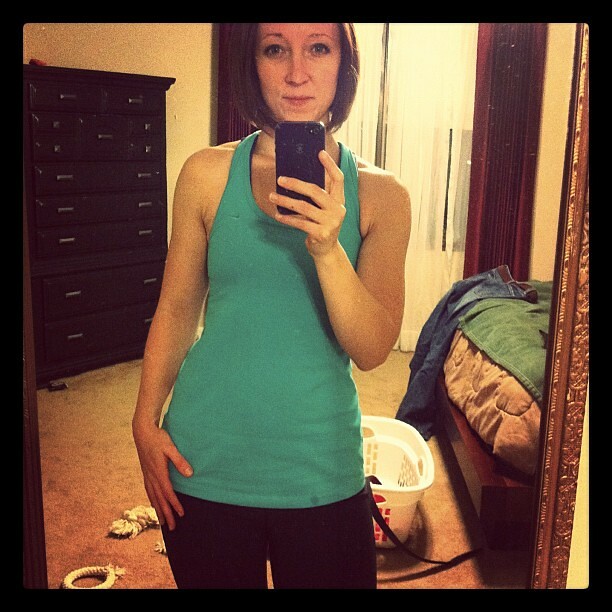 I’ve been going to Bodypump for the past year – off and on – but I’m kind of getting a bit tired of it. This would be a good option. I gave Body Pump a try too. Crossfit has some of the lifting components of Body Pump without the non-movement and overkill in repetition. I like that I get a good strength AND cardio workout. I love how toned your shoulders and arms look, Jes! FABULOUS! You could probably slug someone really hard with that. 😉 Haha!